The Ohaus Compact Scale is ideal when cost matters and dependable results are a must. 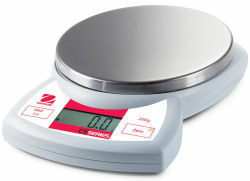 This uniquely designed scale is useful in a wide variety of applications, more than any other scale in its class. Its perfect for use in light production, in the field, the kitchen, the office, and more. Easy operation, long battery life, and great performance make this product a truly remarkable value. 146mm x 133mm / 5.75" x 5.25"